This conceptual mosaic is one of two pieces inspired by the century-old burnt cedar and larch stumps and snags in the Elk Valley near where we live. I wanted to show the evolution of a forest in a circular shape: old stumps gradually vanishing (wind and rot) and the woods around them lush with subsequent growth. Where the forest burned, fire weed grows and the rich soil and ample sunlight promotes the new life phase of the forest. In about 100 years, the new forest will be mature, ripe for another wildfire. Mandala is Sanskrit for circle, a spiritual symbol. 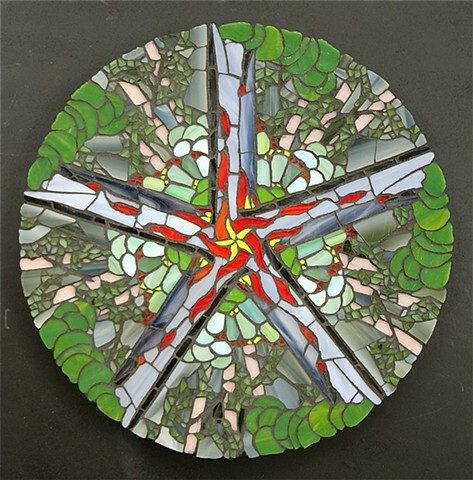 In modern usage, mandalas capture moments in time, embodied as a circular picture or object. Please go to the SHOP page and contact us if you are interested in acquiring this mosaic.